On a lonely, cratered plain near the equator of dwarf planet Ceres, a mountain half the height of Everest spirals into an airless abyss. A few hundred million years ago, briny ice lavas from deep beneath the surface pushed Ahuna Mons up, freezing again as they oozed across the mountain’s rugged peak. That, at least, is a likely explanation for how the strange planetary pimple formed, according to research published today in Science, which adds Ahuna Mons to the ranks of potential cryovolcanic mountains in our solar system. Ice volcanoes sound like something straight out a Narnia-inspired fantasy realm, but for years astronomers have suspected such wonders exist in the frigid reaches of the outer solar system. Pluto, its moon Charon, and Saturn’s moon Titan have all been pegged as potential sites of cryovolcanic activity. Now, Ceres is joining their ranks. The largest object in the asteroid belt between Mars and Jupiter, Ceres has been the subject of an intense scientific campaign ever since NASA’s Dawn Spacecraft arrived in orbit last spring. We’ve marveled over its mysterious bright spots, which turned out (not so mysteriously) to be giant piles of salt. We’ve mapped its surface, named its craters after mythological deities, and speculated about the layers of ice, salt, and rock hidden below. Now, a lone icy mountain offers our best evidence yet that Ceres has been geologically active in the recent past. Analyzing a wealth of images captured by the Dawn spacecraft’s framing camera, a team led by Ottaviano Ruesch of the Goddard Spaceflight Center pieced together an origin story for Ahuna Mons, which sits all by itself on a flat surface pockmarked by a smattering of craters. Volcanism, as we know it on Earth, involves silicate rocks melting under extreme temperatures and pressures, before being squeezed to the surface as lava. While this type of volcanic activity used to occur on Venus and Mars as well, the story gets more complicated when we start to look further afield. Jupiter’s moon Io, the most volcanically active body in the solar system, spews an exotic mixture of sulfur compounds into space. On Saturn’s Enceladus, geyser-like curtains of water ice and salt erupt through cracks in the moon’s thick, frozen shell, blasting alien seawater directly into the gas giant’s rings. But some researchers aren’t convinced. Jeffrey Moore, head of the Geology Geophysics Imaging Team for the New Horizons mission, has spent the last year grappling with features on Pluto that look an awful lot like ice volcanoes, too. In his mind, the evidence for cryovolcanism on Ceres isn’t definitive. Ice volcano or not, whatever built the mountain occurred recently: based on the nearby cratering record, Ahuna Mons is just a few hundred million years old. That’s a geologic blink compared with Ceres’ 4.5 billion year history, and it implies that the dwarf planet has been active for most of its lifespan. 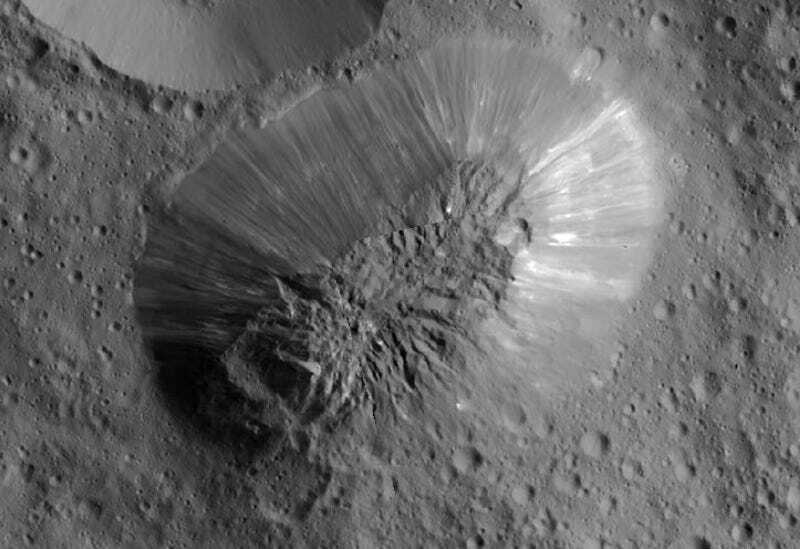 While any core heat from the planet’s formation has likely dissipated, Russell speculates that transient geologic activity can occur today when an asteroid slams into Ceres, releasing enough energy to partially melt some of the ices beneath the surface. Although Dawn’s primary science mission has ended, the spacecraft still has fuel and is expected to continue observing Ceres for months to come. After hovering just 385 kilometers (240 miles) above the dwarf planet’s surface for the past eight months, tomorrow Dawn will begin to ascend to a higher orbit, which should allow the spacecraft to more precisely orient itself toward specific regions of interest. And while there are still many riddles to solve, it’s clear from what we’ve learned so far that Ceres is much more than a simple asteroid.